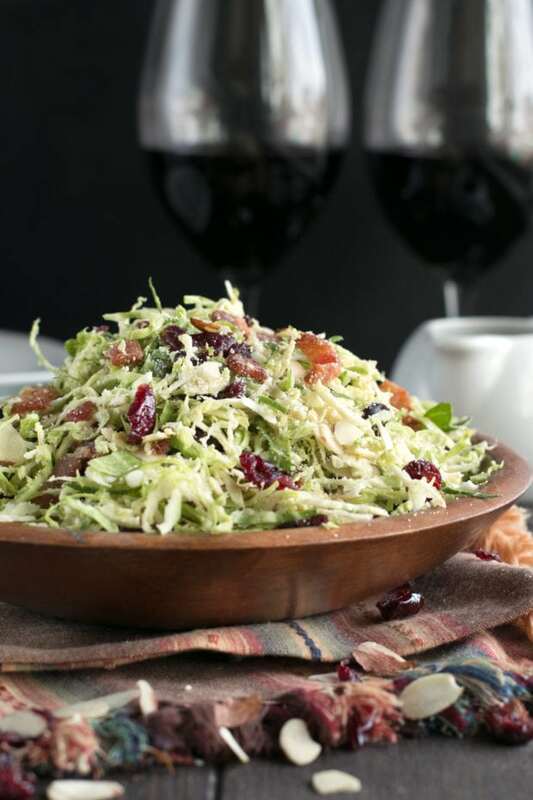 Bacon Cranberry Shaved Brussels Sprouts Salad is a colorful, bright salad that is a perfect accompaniment to your Thanksgiving dinner, no matter what you are serving! With tons of different textures and flavors (and an easy citrus dressing that’s to die for), this savory, tart and nutty salad will win everyone over. This is, like, a REALLY big deal people. Because I don’t do salads. I am the anti-salad girl who will only eat one if I really feel like I’ve been particularly unhealthy for a period of time. And when I do make a salad, I make it with bread like this avocado caprese panzanella salad and this avocado fennel salad. Occasionally though, I remember that salads are actually a good idea and a good thing to make, because they don’t have to be a whole meal. Sometimes they are just the perfect side dish to serve up alongside an epic meal. That’s exactly what this salad is! It’s THE salad that you should be serving up next to your turkey on Thanksgiving Day this year. Well, to start it’s a fun new way to serve up Brussels sprouts for Thanksgiving. 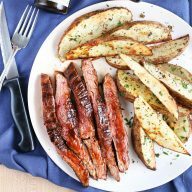 Instead of steaming and roasting them like you usually do, you don’t even have to cook these bad boys. So right there, you are saving a ton of time (not to mention you can totally make this the day before and just leave the dressing out of it until you are ready to serve!). Next, this salad is an absolutely divine combination of a ton of different textures and flavors. 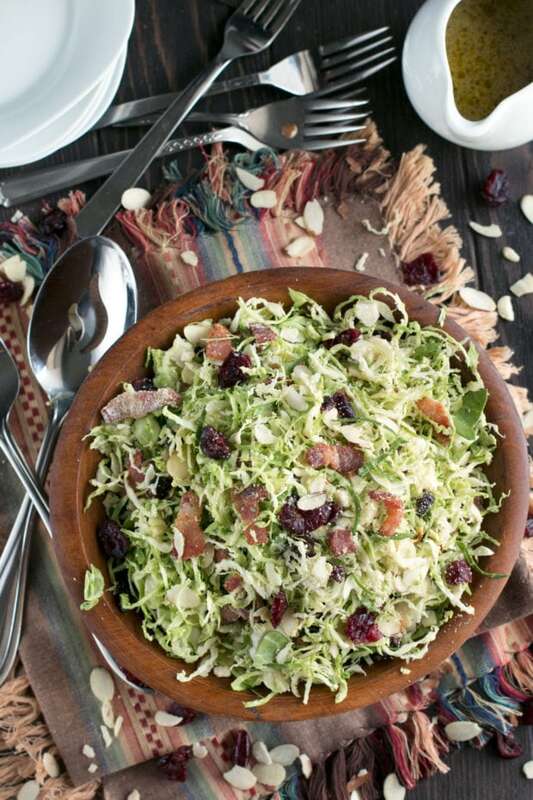 From the tart dried cranberries to the savory, crispy bacon; from the crunchy shaved sprouts to the thinly sliced almonds for just a touch of nuttiness; it all comes together in a bowl of incredible flavors. The best part is the citrusy dressing because it’s an easy dressing to make and it brings an added brightness to the salad! All in all, it’s the perfect complement to a plate full of heavy turkey, mashed potatoes and gravy. Anyone else ready for Thanksgiving already?! for shaving down all those Brussels sprouts! to make that easy peasy citrus dressing that’s oh-so YUM. 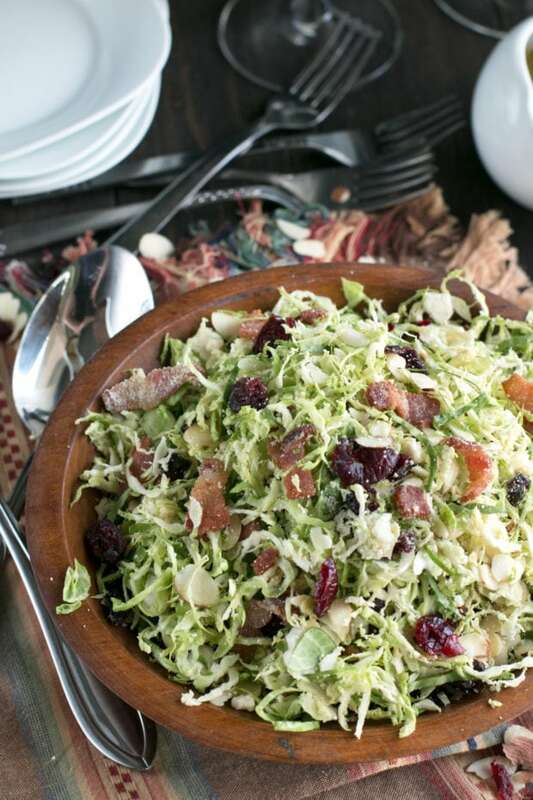 Pin this Bacon Cranberry Shaved Brussels Sprouts Salad recipe for later! This is the perfect salad for serving up for Thanksgiving dinner! 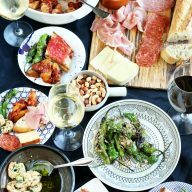 It's an easy-to-make salad with tons of flavors and textures to perfectly accompany anything you serve up for dinner. In a small bowl, add lemon juice, orange juice, garlic, and cayenne. Whisk together to combine. While whisking, slowly pour in olive oil in a steady stream to form an emulsion. Season with salt and pepper to taste. Set aside in the refrigerator. 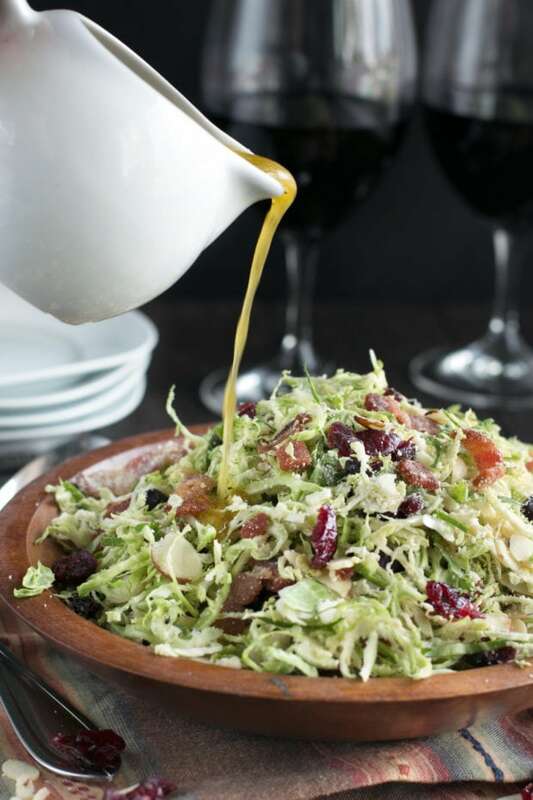 Using a mandoline, shave brussel sprouts into thin slices to form a slaw texture. Rinse and dry once they've all been shaved. 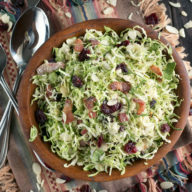 Add shaved sprouts to a large serving bowl. Add bacon, cranberries, sliced almonds and grated parmesan cheese, tossing to combing. When ready to serve, toss with dressing. 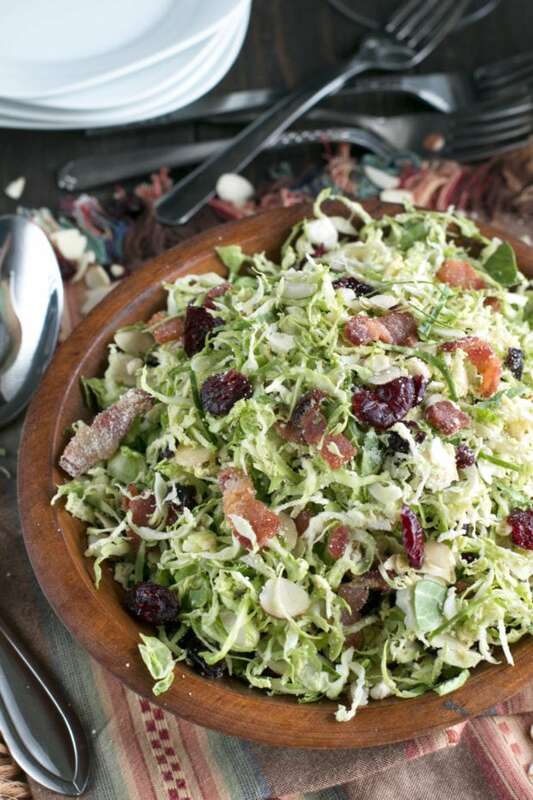 Add almonds, cranberries, cheese, bacon and sprouts to a bowl, tossing to combine. When ready to serve, toss with the dressing.